I have three sets of clothes: summer, winter, and in-between. The in-between clothes live in my bedroom closets year round, but the summer and winter clothes have to take turns. The process of switching them out is a semi-annual ritual that involves a surprising amount of physical labor and even more mental anguish. No small part of the physical labor and mental anguish is caused by the fact that I try almost everything on — to make sure that it fits, that it is in good repair, and that it is still loved, or at least liked. Imagine my horror when I realized that this dress was too short. Note that I described my reaction as horror and not surprise. 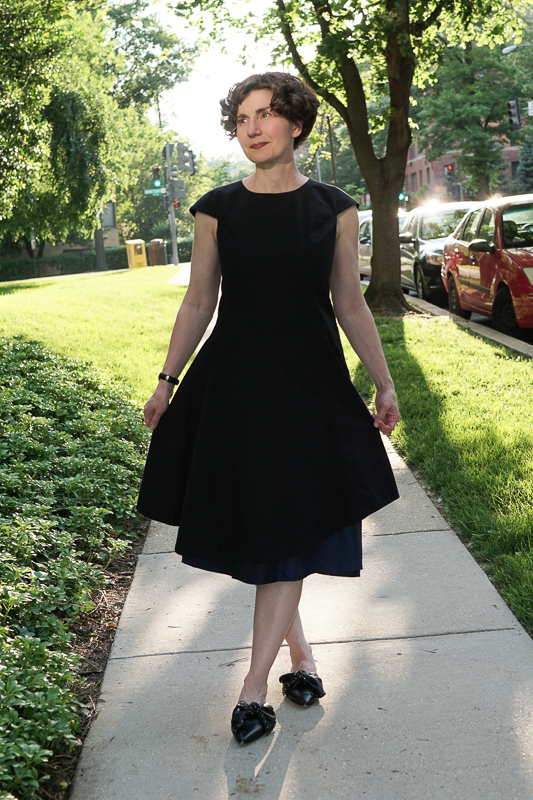 At the end of last summer, I made the mistake of disobeying the care label on this 100% cotton dress — which said DRY CLEAN ONLY — and threw it in the washing machine. It came out weirdly wrinkled and noticeably smaller than its sister (the raspberry sorbet version). I sent it to the drycleaner hoping that it would come back smoother and longer. It did not. It came back smoother, but not longer. So I folded it up and put it in the giveaway pile. And then I had an idea: I could layer it over another dress! Why not? I had just the dress for this purpose. Perhaps this photo will refresh your memory? When I bought this slip dress back in 2016, I was uncertain about the length, but decided to wait and see. After this summer’s wardrobe audit, I brought the dress to Fatima with instructions to take it up to knee-length. I think this is an interesting combination on a couple of levels. I love the inky blue paired with black. I like the menswear patterns combined with a feminine dress. I am intrigued by the layering of these distinct shapes — particularly because the black dress has such a definite form. 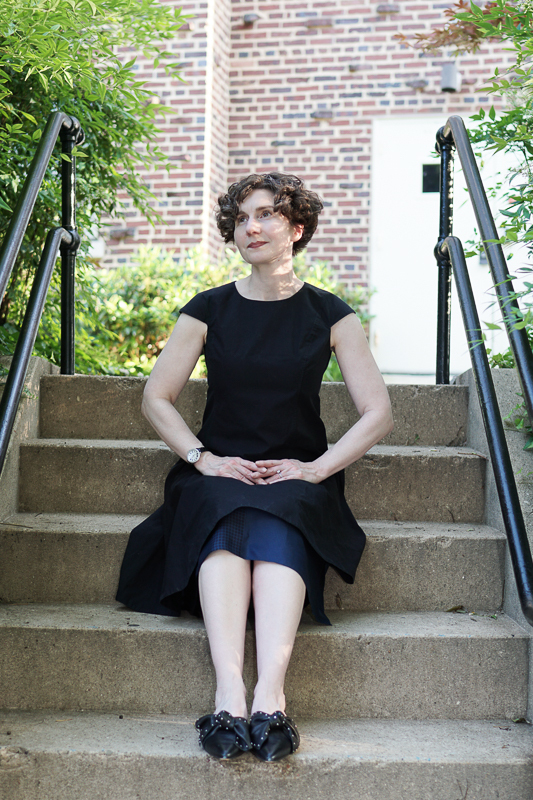 The black dress is stiff and angular — and moves out from my body a little like a 17th Century skirt over panniers. Sort of. The slip is fluid silk. In a perfect world, the slip would be ingeniously sewn on the bias to create a fluted skirt that would relate to (not parallel) the lines of the dress, but achieving that effect would cost far more than I am willing to invest for a gesture that only you and I would appreciate. To the left, you can see that I am accepting the path of least resistance and cost. Perhaps we will revisit the shape of the slip dress in Summer 2020? Let’s take a moment to appreciate the mules, which have insinuated themselves into anoher outfit. I wore them Monday-Thursday last week. The only drawback to this pairing is that I look kind of pregnant in profile. I am not pregnant. The over-dress is a loose fitting, vaguely trapeze silhouette. The under-dress is lightweight but voluminous. In ideal circumstances, the over-dress would constrain the under-dress; here, instead, the under-dress is inflating the over-dress. Hmmmmm. Nevertheless, I think this works — and it prolongs the life of my black cotton dress until I can devise a better solution. * I brought four old pieces to Fatima for tinkering. More to follow. Ooh! I love this combination — genius! Those mules don’t bother your feet? There is so little padding or support of any kind! your feet don’t slip out of them when you are walking uphill? These have been my experiences with mules. Nicky — Your questions are fair ones. These mules are not padded and I wish that they were. Without padding, they are only suitable for light walking days — and absolutely no running. But if I am just walking to the Metro and walking around my office, they are fine. I would not, however, recommend these for anyone with foot pain or ankle problems. I do so enjoy your recounting of the semi annual ritual of clothing sorting. It is tiring and confusing especially here in New England where the temperature is fifty one day and ninety the next. I like the dress and your modifications are fine. The mules are strange. It is an ingenious solution, and the result charming. I’m a total sucker for blue and black together, so I love this. The shoes are the perfect complement to the outfit. I’m no lover of mules, but these do tickle my fancy. The mules make me laugh. In a good way. They would put me in a good mood every time I looked down at my feet. And that is an inspired dress-over-dress. I love it. But will it be less or more controversial than dress-over-pants? I’m not sure I share your opinion that the black, beautifully styled/shaped dress is too short. It’s difficult to tell from the first photo but it seems like it drops below your knee…..an OK length, I would think, particularly when worn with mules. 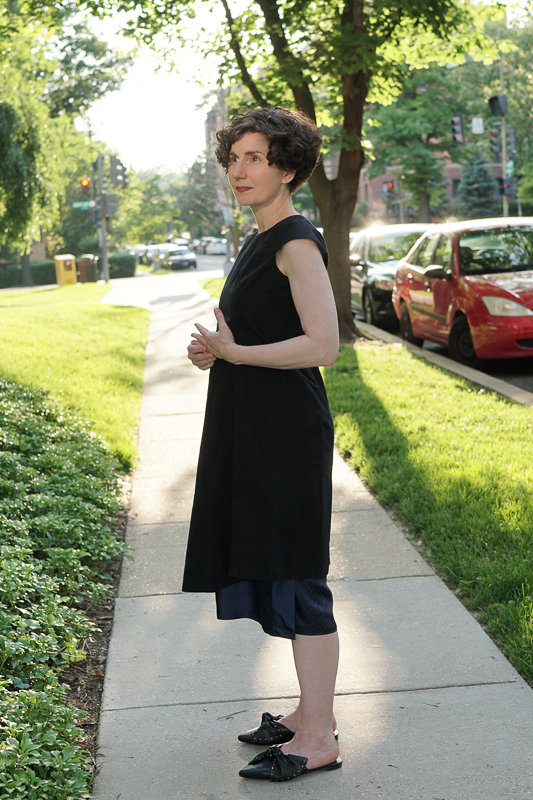 The layering with the slip dress, I feel, adds too much material for a summery cotton dress in D.C. humidity. 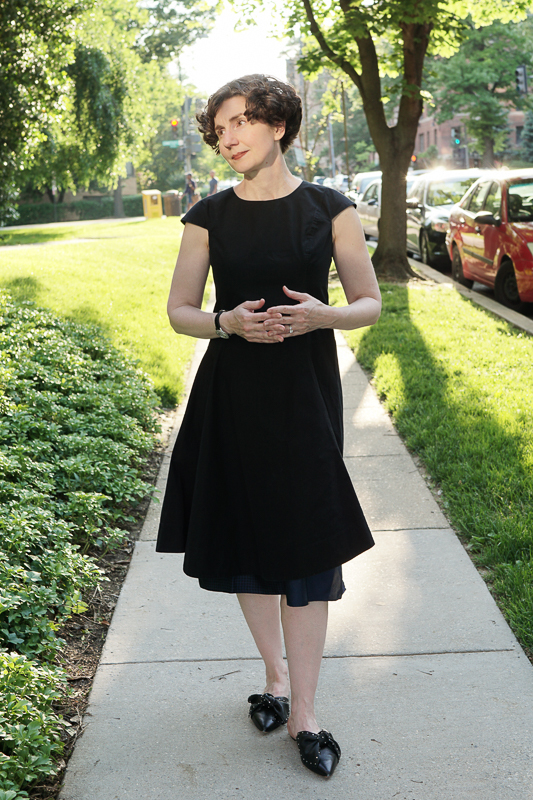 I love the new length of the black cotton dress! No under-skirt needed, as far as I am concerned. When I saw the first pix I thought that the dress was a bit too long! I like the dress over dress and, of course, it brought to mind thoughts of how to do that look purposefully in my own wardrobe. Love blue and black together very much. Wear on some cooler days though. You and Fatima work well as a team. I’m with missannethrope and violinist: I think the black dress shrank to a good length! Right at the knee. Flattering and universally stylish, especially on a petite person such as yourself. The mules. Well, they put me in longing mode for a long-ago pair I had. I called them my Arabian Nights shoes, although the toes did not curl up, Genie style. The were a slightly pearlescent bone color. Very comfy. You could wear a belt with this and then not appear anywhere near pregnant. I’m very taken with the slip dress as a layering item aspect of this. Inspired by this dress I bought one in Tencel denim blue and have been working on a combination with it. My monitor doesn’t show the color difference between the black/blue very well, but I like the combination, at least in concept. I like the combination, but agree with others that the shrunken dress doesn’t look too short on its own! 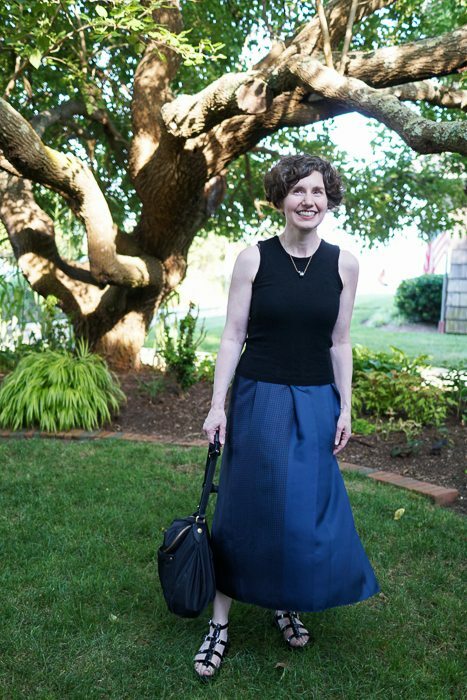 I always prefer hemlines that hit at that narrow point just above the knee or just below; a mid-calf hemline is disastrous for my proportions.